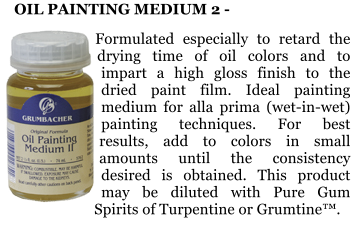 GALKYD Galkyd thins oil colors and increases transparency and gloss. 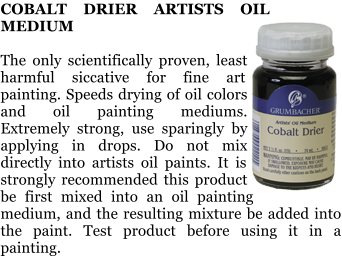 When used in greater proportions with oil color, Galkyd will level brush-strokes, creating an enamel- like surface. 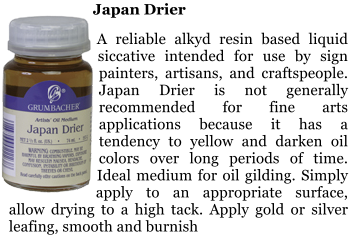 Galkyd is our fastest- drying painting medium. Thin layers will be touch-dry in approximately 24 hours. 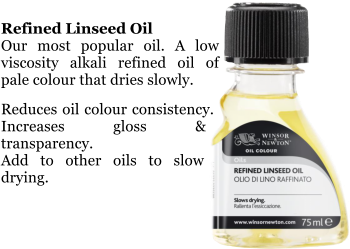 A non-yellowing mixture of stand oil, resin and refined petroleum oil, this medium, when mixed with oil color, will accelerate drying and harden the painting surface. 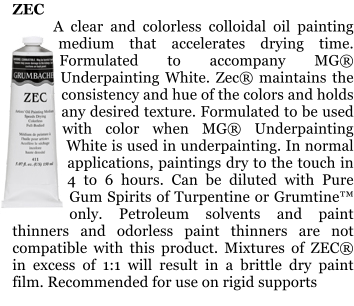 As a glaze, it will provide a glossy surface which deepens the color. Clean the rim of the jar after use to avoid adhesion with lid. 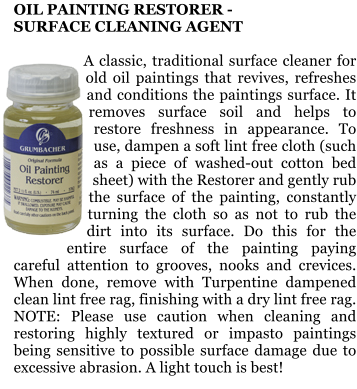 GALKYD LITE Galkyd Lite thins oil colors and increases transparency and gloss. When used in moderation with oil colors, Galkyd Lite will retain brush strokes. Galkyd Lite is more fluid and less glossy compared to Galkyd. Thin layers will be touch- dry in 24 to 30 hours. 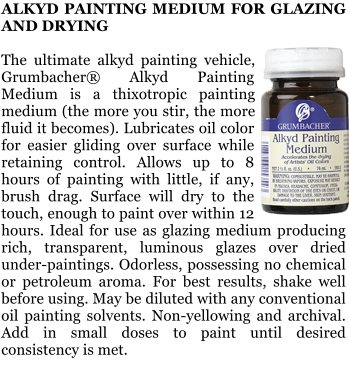 GALKYD SLOW DRY Galkyd Slow Dry thins oil colors and extends working time. Galkyd Slow Dry is more fluid and less glossy than Galkyd Lite. 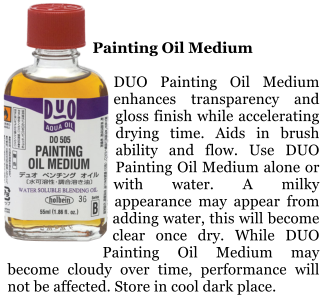 Use one part Galkyd Slow Dry to one part oil colors to paint wet- into-wet for at least a day. NEO MEGILP Neo Megilp is a contemporary version of Maroger. 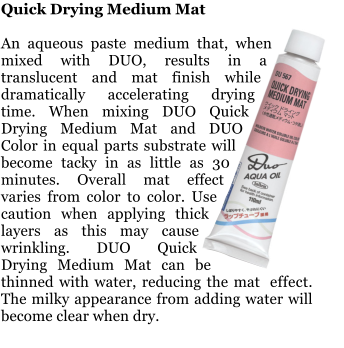 This soft gel medium maintains the body of oil colors, increases transparency and flow, and imparts a smooth, silky feel. 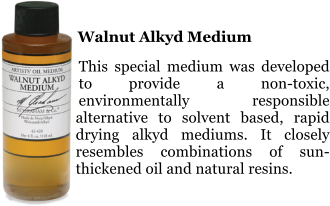 Neo Megilp dries at a moderate rate and remains workable for hours. 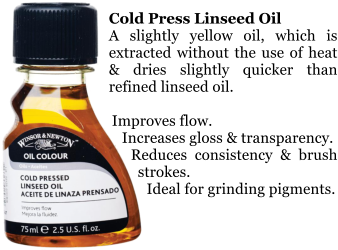 Neo Megilp gives colors a satin gloss. 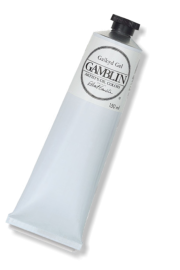 GAKLYD GEL Galkyd Gel is a stiffer gel compared to Neo Megilp that holds thicker, sharper brush marks and dries more quickly. 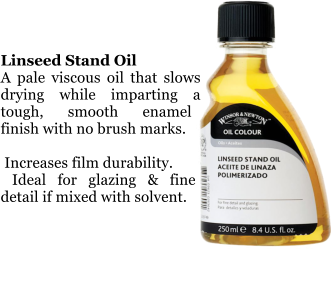 Galkyd Gel increases transparency of oil colors and creates impasto. 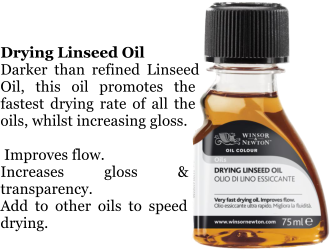 Quick Drying Liquid Enhances transparency and gloss finish while dramatically accelerating drying time. When mixing DUO Quick Drying Liquid and DUO Color in equal parts, substrate surface will become tacky in as little as 30 minutes. Adding too much DUO Quick Drying Liquid may cause unstable results. Do not exceed a 50/50 ratio. 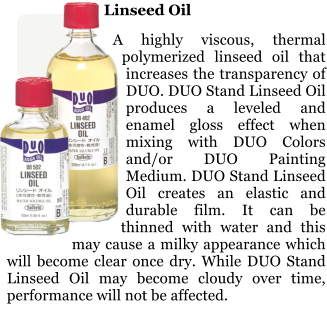 DUO Quick Drying Liquid can be thinned with water, reducing the overall effect. Milky appearance from adding water will become clear when dry. 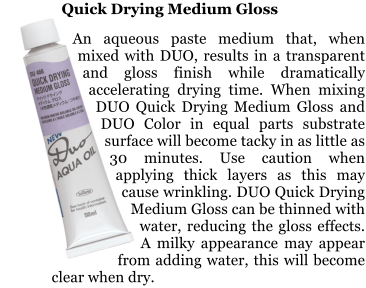 While DUO Quick Drying Liquid may become cloudy over time, performance will not be affected. 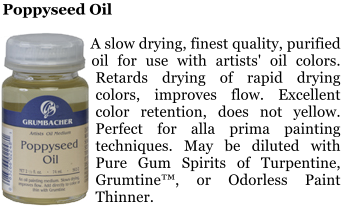 COLD WAX MEDIUM Cold Wax medium is made from naturally white, pure beeswax. 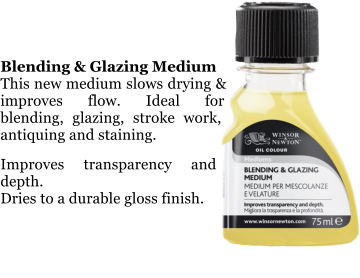 Formulated to knife consistency, Cold Wax Medium makes oil colors thicker and more matte. 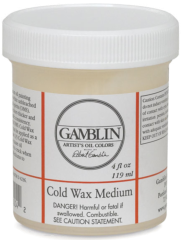 Cold Wax Medium can be used to make Gamblin mediums and Gamvar more matte. It can also be applied alone as a matte varnish. 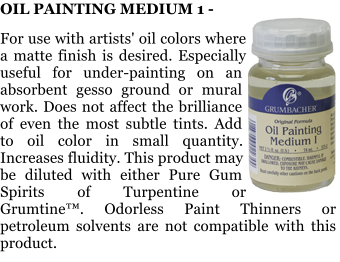 Please note: Painters who are using more than 1/3 cold wax medium to 2/3 oil paints should paint on rigid supports or paintings may crack when moved. 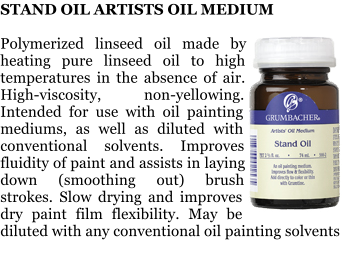 By mixing 1/2 Cold Wax Medium and 1/2 G- Gel, painters can paint on flexible supports. Please refer to Gamblin Cold Wax Medium Tech. Sheet for additional information on the uses of this versatile medium. 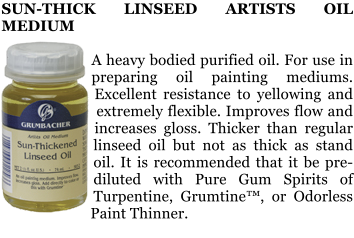 LINSEED OIL - REFINED (low acid) Pressed from American flax seeds. 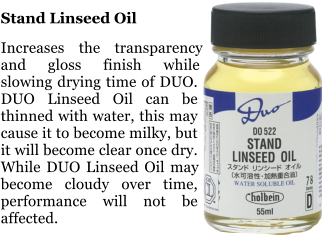 This is as light and pure as industrially produced linseed oil can be made. Use in moderation to thin oil colors or as an ingredient in traditional painting mediums. 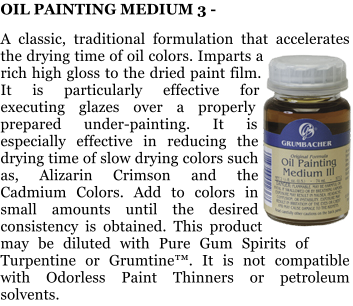 Mediums Set This set is an ideal introduction and includes 2 oz containers of Galkyd, Gamsol, Neo Meglip, Refined Linseed Oil, Cold Wax and a 37 ml tube of G-Gel along with the Gamblin Guide To Oil Painting Mediums. Excellent Holiday Gift Idea! 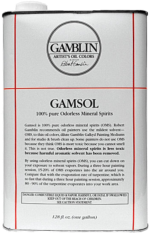 GAMSOL Odorless Mineral Spirits Gamsol is the safest solvent that allows oil painters to utilize all traditional painting techniques without compromise. Primary Uses for Gamsol: Thinning oil colors. 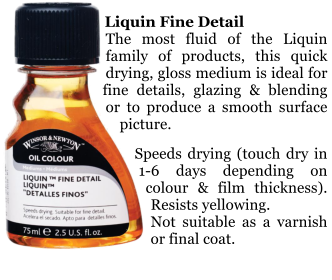 A little goes a long way; stiff oil colors relax immediately when a little Gamsol is added. Be careful not to thin oil colors too much with solvent alone, this can compromise the ability of the paint to form a paint film. Modifying painting mediums. Our Galkyd line of painting mediums are formulated with Gamsol, so they readily accept Gamsol as a thinning agent. Note: Gamsol should not be added to painting mediums made with natural resins (dammar, copal, mastic). 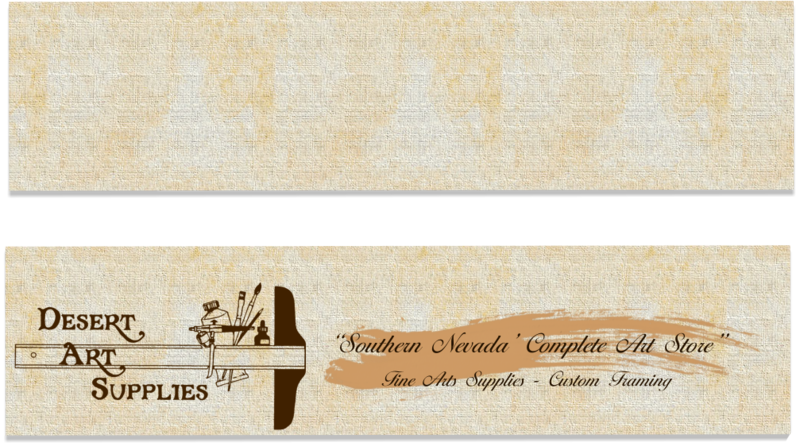 They require strong solvents such as turpentine. Studio clean up: brushes, palettes, palette knives, etc. How does Gamsol achieve this level of performance and safety? 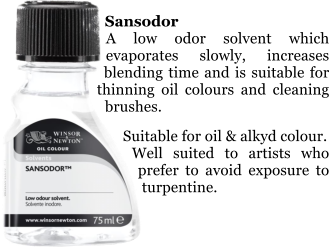 Most solvents available to artists come from the industrial paint industry where solvent power and cheapness is prized. Gamsol is special: it is made for products and processes that come into more intimate contact with the body such as cosmetics, hand cleaners, and cleaning food service equipment. 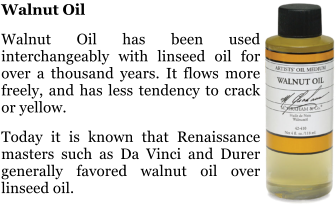 Gamsol is a petroleum distillate but all the aromatic solvents have been refined out of it, less than .005% remains. Aromatic solvents are the most harmful types of petroleum solvents. GAMVAR The perfect picture varnish. 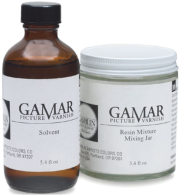 ™ Gamvar saturates and gives greater depth to the colors in your painting and gives your work a unified and protective semi-gloss surface. 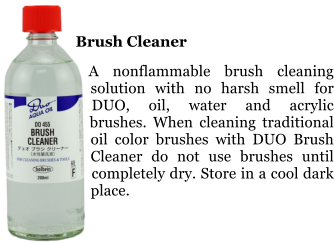 Developed in collaboration with the National Gallery of Art, Gamvar goes on water-clear, stays water-clear and can be easily and safely removed with Gamsol. 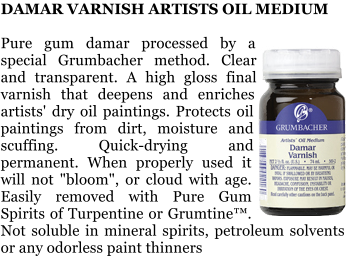 Gamvar is virtually odorless and ready to apply. Brush apply. Do not spray. Gamvar can be applied when the thickest areas of your painting are thoroughly dry and firm to the touch. 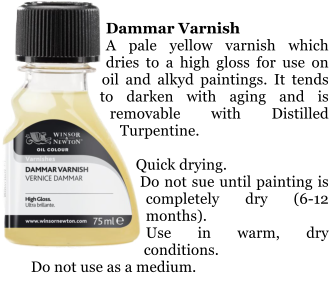 Please visit our Using Varnishes page for additional information, including application tips and the use of Cold Wax Medium as a matte varnish. 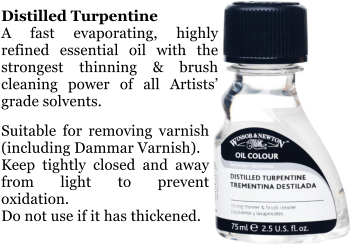 Venetian Turpentine A heavy, thick and resinous liquid made from European pine trees and used in oil mediums, varnishes and resins. 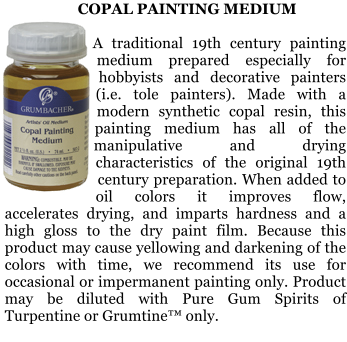 As a medium, it offers transparency and a glossy surface to oil painting. 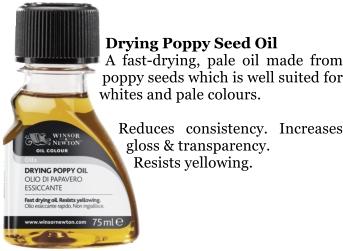 Because it has a characteristic of yellowing with time, it should be used in combination with dry oils like stand oil or volatile oils like turpentine. Available in 55ml bottles. 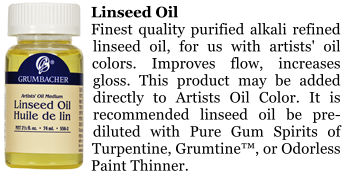 Spike Lavender Oil Distilled from a variety of the lavender plant family, this fragrant oil has properties similar to turpentine but has a greater tendency to oxidize or gum and does not evaporate as readily. Available in 55ml bottles. 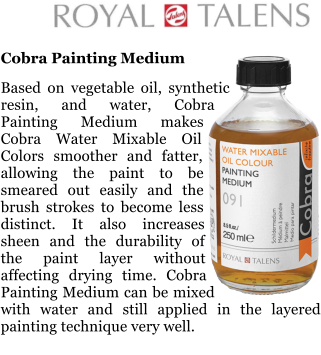 Artist’s Painting Medium A slow drying, gloss medium which is ideal for fine detail work, glazing and smoothly blended areas with no brush marks. Reduces consistency & improves flow. 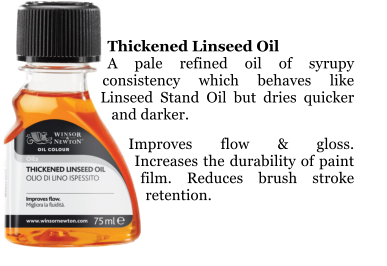 Suitable for oiling out & enriching dull patches. Resistant to yellowing.